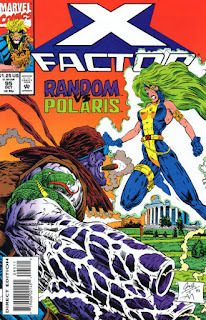 Polaris meets Random on a DC rooftop, only to be attacked by him. 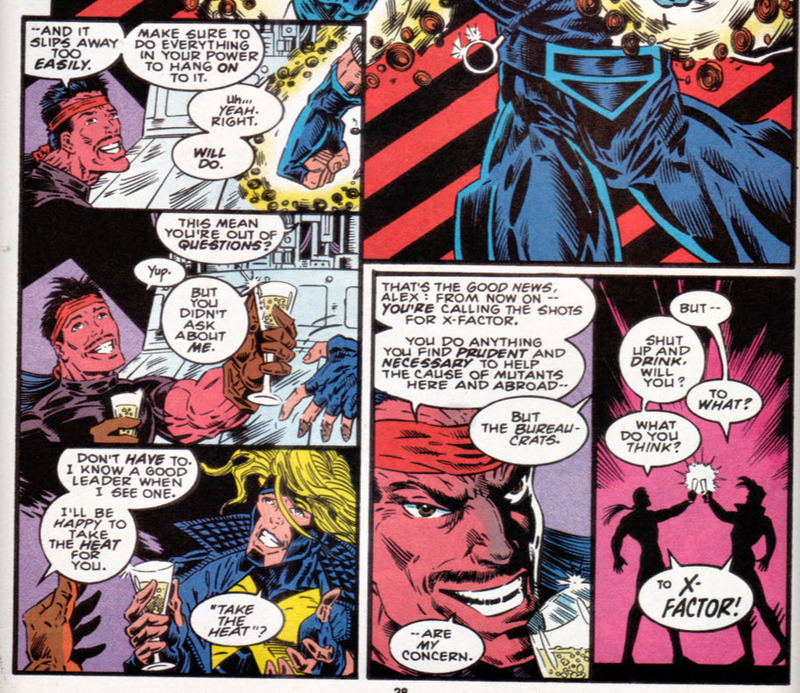 Meanwhile, Havok meets with Forge, who questions whether or not he should start over with a new X-Factor roster. This prompts Havok to argue in defense of each of his teammates, which is enough to convince Forge he has the right people and that Havok is the right person to lead them. Meanwhile, Polaris manages to overpower Random, and leaves him in a puddle underneath his damaged car. 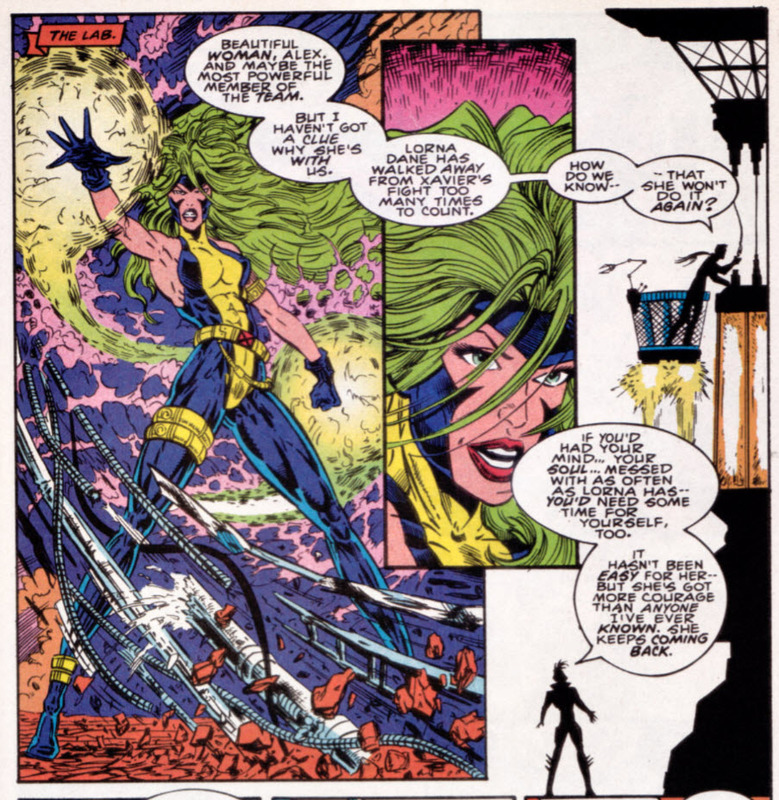 Later, as Polaris describes the fight to Havok, she says it almost felt like Random was rooting for her to win, but the pair is interrupted by a sobbing, slobbering Wolfsbane, who has fled Muir Island, saying Havok's pull on her soul is too strong and she's got to be with him. 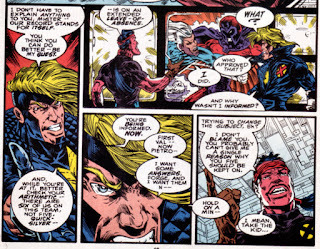 Forge informs Havok in this issue that Quicksilver has been granted an extended leave. 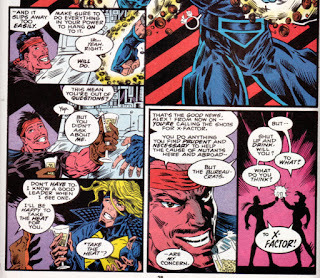 In fact, this more or less marks the end of Quicksilver's tenure as a member of the team (just two issues after finally receiving his own official X-Factor uniform); he'll pop up in few other X-books between now and "Bloodties", but after that crossover he'll effectively be absorbed back into the Avengers office until "Onslaught", and won't appear in a regular presence in X-Factor until his turn as a quasi-villain in the wake of M-Day during the series' 00s revival. Random, who returns in this issue for the first time since issue #92 (not counting his brief cliffhanger appearance at the end of the previous issue), will become something of fixture in the book during DeMatteis' run, and to that end, he starts developing the character into something more than a one-off joke about comic trends in the early 90s: here, we learn he's involved with someone named Vera, and that his tastes run a bit older (Ford, Capra and Bennie Goodman). 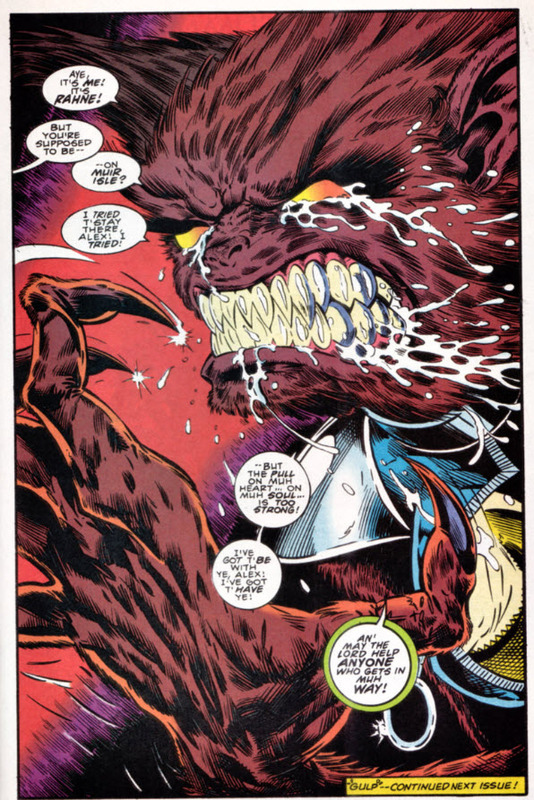 A lot of this stuff (here, and in future issues) will get complicated by reveals made by later writers regarding the character, but for now, they represent the first concerted effort to make the character more than a joke. In a rare bit of expedited plotting for this era, it's revealed that Random was hired by someone within the government to attack Polaris. Of course, we still don't know who, or why (it will turn out to be, after a fashion, Malice), but still, that's more info than usual for a mystery this soon after being introduced. Wolfsbane interrupts Havok & Polaris' attempt at having some adult time, more out of control than ever, beginning a short period of time in which her obsession with Havok escalates even further and she's more animalistic than ever. Forge says that Havok seems like someone who could snow his way through a college paper, something else Havok and I have in common (along with a desire to be like Cyclops and an affinity for powerful women). 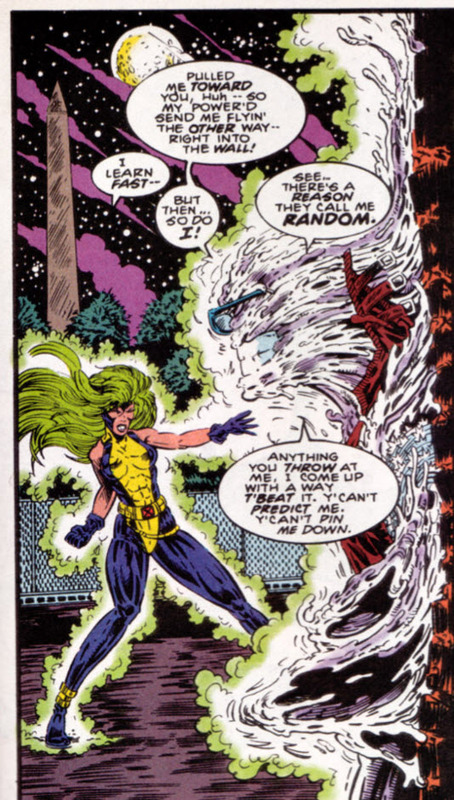 Random's powers get fleshed out a bit more in this issue as well, as he says his power automatically counters any attack thrown at him (which leads to Polaris smartly using her power to attract him when she wants to repel him), and that he'll always find a way to counter any attack used against him. 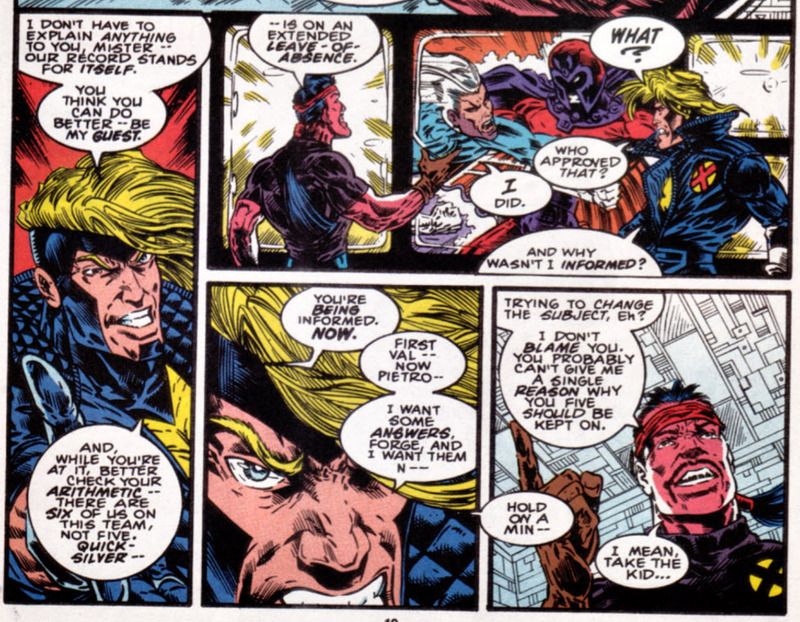 Guido tries to get Madrox to come out carousing with him, but Madrox is too morose. When presenting Polaris to Havok in order to hear his arguments on her behalf, Forge describes her first and foremost as being beautiful, which, I'm not really sure why that's relevant. Forge tells Havok that he has free reign to run the team as he sees fit, with Forge willing to take the heat for their actions with the government, changing the dynamic of the team and their liaison, with Val having been much more hands on. 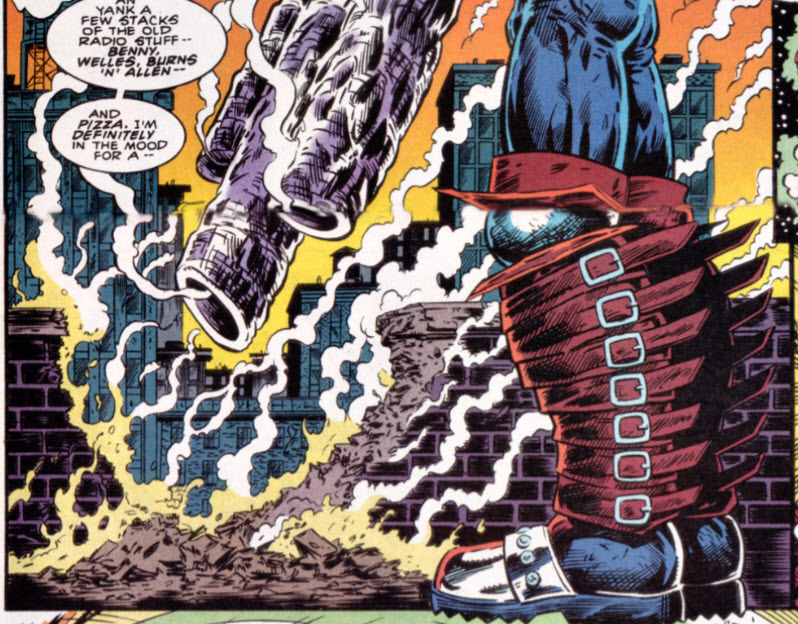 They get overshadowed by pouches and useless arm/thigh straps, but boots in the 90s were often similarly ridiculous, including Random's here. It must take him hours to put on his boots with that many straps to buckle. 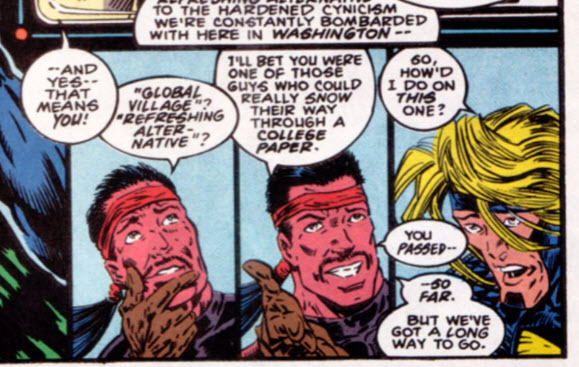 Forge references new people being in the White House, presumably one of those acknowledgements of real world politics (the transition from President Bush the Elder to Bill Clinton) comics does every so often. 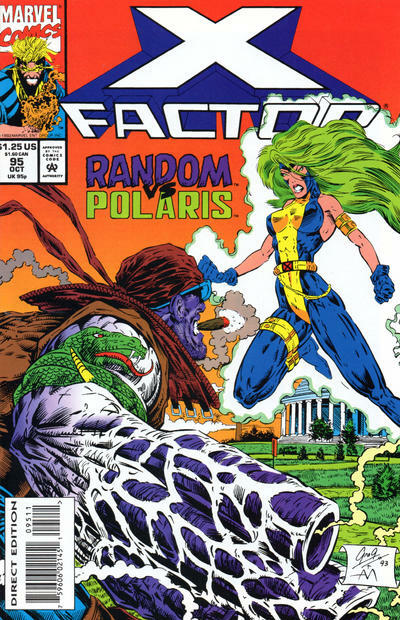 This is the first issue of JM DeMatteis run (still being plotted by Scott Lobdell) to feature a significantly action-orientated A-plot, with Polaris & Random fighting across the issue. But it still remains very DeMatteis-ian (and Davidian) via the B-plot, in which Forge goads Havok into providing character analysis of his teammates. 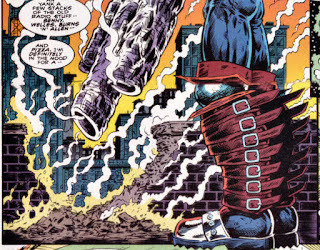 It's not unlike "X-aminations" from issue #87, but less in-depth and more straightforward. Having the analysis come from a flustered Havok creates some fun moments, but it lacks the verve and insight of the previous effort. The result is that the action stuff is actually the more entertaining part of this issue: Polaris rarely gets the action spotlight, and seeing her go toe-to-toe with Random is both a lot of fun and an effective showcase for her resourcefulness (it gets overlooked because she went so long without a sustained presence in a series, but she's been doing this almost as long as the original X-Men), while her repeated use of Random's fancy car as a weapon against him is something that wouldn't have seemed out of place in one of the Peter David issues. 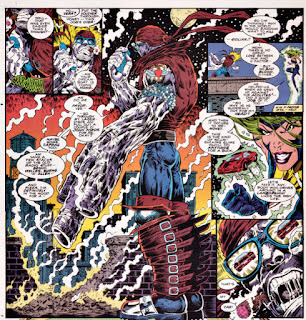 Tomorrow, Wolverine & Jubilee fight more Sentinels. Next week, X-Men #25 and X-Force #27. Wow. Alex’s hair. Just... Wow. Also, I’m struck by how Forge in profile on Pg. 8 looks like an utterly crazed man drawn by Don Simpson. Kind-of a clever title — one I’d have easily ascribed to Peter David being mischievous (to put it charitably, anyhow). Not the one Hank dated, presumably. The affinity for laserdiscs could be a sign of the times or just a sign that he’s a cineaste snob/geek but what really strikes me about that whole convo is that he’s queueing up an entire day’s worth of veg time at minimum. Ha, as a follower of hockey escapades I'm pleased to report you that Winnipeg Jets fans too get a plenty of mileage from GM Cheveldayoff's catchphrase "It's a process", though not for pronounciation reasons but for game and lack of reasons. Interesting note, Blam. I always pronounced Polaris as "Po-LAIR-is". I still do, in fact; I don't think I've heard it said otherwise, or if I did, I probably assumed other people had it wrong. The one I still laugh about sometimes, though, is "chassis", which I pronounced exactly as it's spelled into my thirties until someone corrected me. (Though to be fair, I probably only said the word five times in my entire life up to that point.) I had heard the word said aloud over the years (pronounced "chassy"), but somehow never made the connection between the word I was butchering and the word people were saying! It sounds like “chassis” for you is what “epitome” was for me — read it; heard it aloud; didn’t make the connection for years. And speaking of “chassis”: How nuts is “chamois” = "shammy"? At least you’ve been saying “Polaris” right.